As a coach, most of my clients come to me feeling as though they’re in a rut. They’re just not finding flow in their work life, relationship, business, or life in general. They’re lacking clarity, drive and confidence and are feeling like they’d like things to be different but they’re not really sure what that means or what their dream life actually looks like. They feel like they’re ticking boxes just for the sake of it or running themselves ragged on a whizzing hamster wheel. They’re either starting things and then losing motivation or paralysed, with no idea of what to do next to make themselves feel more confident, more motivated, and more inspired about their life. If you don't know where to start to get out of your rut, try decluttering. I love Marie Kondo's method from The Life-Changing Magic of Tidying Up of asking myself 'does it spark joy' and if it doesn't, I find the item a new home or donate it to charity (I only throw things away when I really have to - less waste!). Give your desk a good tidy, clean out your wardrobe, make your bed with fresh sheets or open your windows and let some fresh air in. Taking a walk or solo picnic in nature or heading to your fave cafe to work or journal can make a big difference to your mental state as well. Whether you declutter or switch up your environment, you're one step closer to getting out of that rut! Write a big list of all the things that you love to do - from small things like having fresh flowers in the house and drinking your favourite herbal tea in the morning to bigger things like travel. Make more time for these things in your life by adding them into your calendar. Start where you are – for example, if you’d love to travel the world but you’re not in a position to do that yet try being a tourist in your own city or planning a weekend roadtrip. Rather than keeping your big dreams under wraps and only revealing them to friends when they’re achieved and perfect, tell people who will keep you accountable in a loving way. Months before Exhale opened, I told all my friends about the idea! They would ask my for updates and offer help and advice and it made the process much easier and kept me motivated as well. Find a coach that you connect with and reach out about working with them. As a coach, getting my clients out of their ruts and on their way to their dream life is my speciality! I’ve worked with coaches myself and it’s so helpful to have someone on your side, supporting you, and there to talk things over along the way. Start to take notice of the little nudges you’re getting about things you’d like to try or look into. 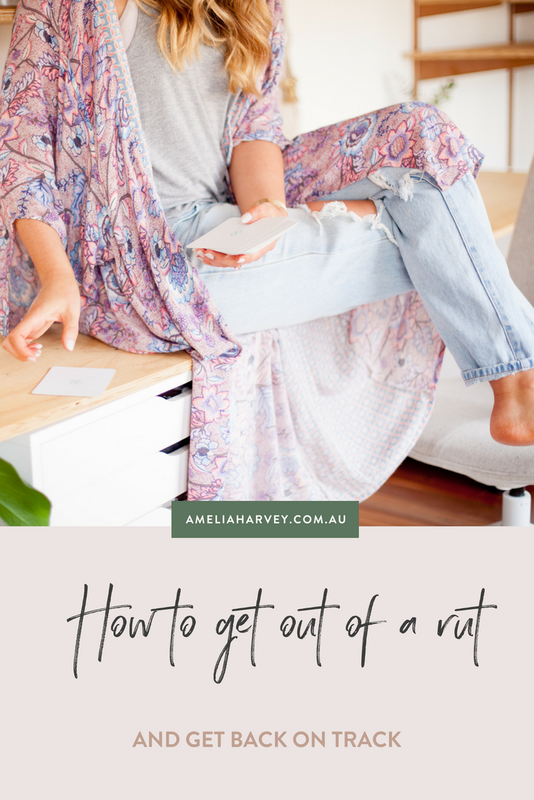 These are often things you think would be great but before you’ve taken action, your inner critic has jumped in and sabotaged you with thoughts like ‘I don’t have time’. ‘I can’t afford it’, ‘People will think I’m crazy’ or any other limiting beliefs that it likes to throw your way! Had the idea of taking an art class on the back of your mind for a while? Book it now! Toying with the idea of yoga – find a studio nearby and sign up for a beginners course. Thinking about taking a new career direction? Research your study options, reach out to contacts, or get in touch with someone who’s doing what you want to do and ask for their help. Wanting to take a trip? Map out a savings plan and put it in your calendar! It can be tricky to get out of a rut without any idea of where we're headed next! Getting clear on your values, purpose and direction will help you become more motivated to make small changes that align you with the person you want to be and the life you want to live. You're probably thinking 'That sounds good, but HOW do I figure out my direction?!' - don't worry, I've got you covered. Enter your details below to get a copy of my Find Your Purpose journal prompts delivered straight to your inbox. These questions will shed light on your deepest desires and values, all you need is a pen and paper. Break your big dreams down into small steps that you can easily check off. Put these in your calendar and work through them – no more overwhelm! 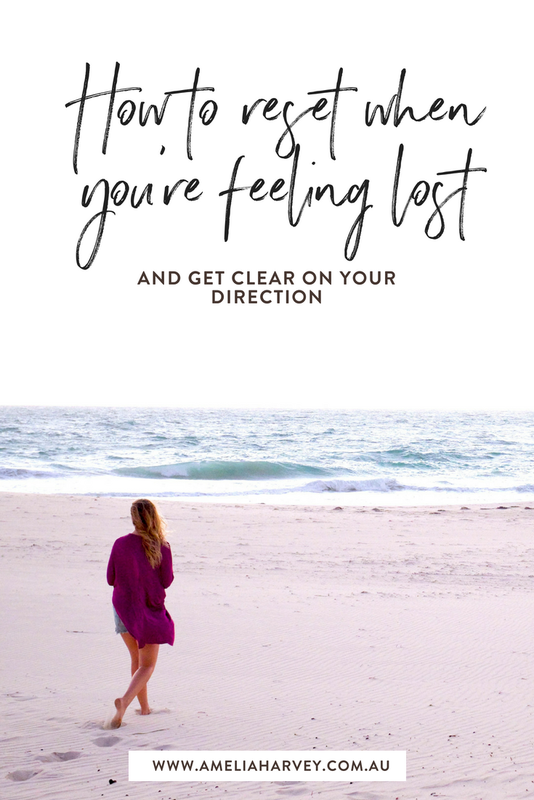 Know someone feeling a little stuck or directionless? Share this post with them! If you'd like to work with me and get on track to creating a life that feel amazing, learn more about my life coaching programs here.